When art meets food, it is not only benefiting your vision but also delighting your palette simultaneously. With that in mind, Bibo Chef Mutaro Balde pays a tribute to the 28-year-old Hong Kong based Portuguese urban artist/Sculptor VHILS aka Alexandre Farto, known for his public portraits whose work reflects the consequences of development in cities all over the world by adding layers then craving on it and exposing the layers behind instead of erasing. A specially crafted a five-course "Debris" dinner menu by Chef Balde drawing inspiration from VHILS's explosive style and architectural aesthetics both on the wall and on the plate in conjunction with his new solo exhibition presented by Hong Kong Contemporary Art (HOCA) Foundation. Some of VHILS' art works are also on displayed and exhibited at BiBO during this "Debris" menu promotion runs till 17th April 2016. Priced at HKD$1250 + 10%. A HKD$200 will be donated to HOCA Foundation for sponsoring the TRAM project happening in Hong Kong upon ordering this special curated menu. One of the many VHILS's art works in BiBO. This is a very harmonious dish as the white asparagus had a very sweet taste, the subtle flavor of the chicken juice and pepper seasoning added some kick, with the crunchiness of the asparagus is absolutely perfect. Just the way how asparagus shall be enjoyed! This beautiful dish has many riches to enjoy: fragrance, emulsions/foam, and a piquant slither of salty cheese tempered with a dash of parsley puree. Slow-cooked sagabuta pork, cumin and carrot puree, beetroot, baby onion petals and foie gras ravioli. The pork meat was firm in texture and subtle in flavor yet moist and very easy to cut. It is gorgeous in flavor with the carrot and cumin adding to the deliciousness. Poached line caught sea bass, black truffle mashed potatoes, endive petals, grilled squid and beurre blanc. The sea bass had a lovely soft flesh to the touch and generous in portion, with delicate flavours provided by the beurre blanc and truffle mash served by the side that was not overly dominating with the right balance. This pre-dessert is harmony of flavours, with great fresh fruit finely diced to be able to blend with the fresh coconut taste of the delicious sorbet. The crepe was a classic French concoction and exuded a dense richness of chocolate in between the crepe layers and had a lightness of touch to the knife, with the cream and ice cream adding that traditional depth of flavours to be savoured. White chocolate mousse, hazelnut rocks, blueberry balsamic sauce, raspberry sorbet. This delightful combination of seemingly random ingredients was stunning in the creation of different textures, every mouthful delivered something unique that stood out and was so delectable. 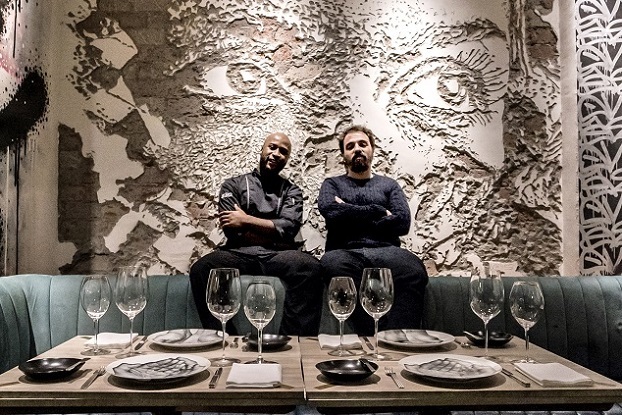 Chef Mutaro Balde & artist/Sculptor VHILS aka Alexandre Farto.